Ten lucky winners will get the bundle of their choice. 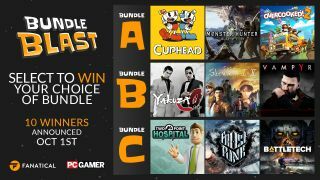 To celebrate Fanatical's Bundle Blast, which features 30 bundles at great prices (we picked out some highlights here, but new ones have been added all week), we've teamed up with the online retailer to offer ten lucky readers the chance to win the Steam bundle of their choice. You can see the three bundles on offer in the graphic above. Bundle A includes Cuphead, Monster Hunter: World and Overcooked 2, while Bundle B includes a duo of great Sega ports in Yakuza 0 and Shenmue I and II, as well as Dontnod RPG Vampyr. Finally, Bundle C includes the excellent Two Point Hospital, the gruelling but wonderful Frostpunk and Battletech. You can enter the competition in a bunch of different ways, and full instructions for entry are below. Note that this competition is operated by Fanatical, and you can find their terms and conditions here. The 10 winners will be announced on October 5th, extended from the original date in the images above. Good luck!